An absolutely gorgeous tea set made with the connoisseur in mind. We have assembled an assortment of classic favorites and exciting flavor profiles from around the world-all encased in a beautiful book box. Curl up with a great book and a relaxing cup of tea! This set includes: Spiced Apple Tea (10 bags), English Breakfast Tea (10 bags), French Vanilla Tea (10 bags), Lemon Honey Green Tea (10 bags), Mint Moroccan Tea (10 bags), Orange Black Tea (10 bags), Pomegranate Green Tea (10 Bags), and Honey Hibiscus Tea (10 Tea Bags). This set makes a perfect gift for your Mom, Sister, Friend, Boss, or anyone who loves tea! MAKES A GREAT GIFT - Arrives ready to be wrapped and gifted to your Mom, Sister, Friend, Boss, or anyone who loves tea! Perfect for all occasions. STEEP AND ENJOY - With a variety of flavors, you can pick the perfect for the perfect moment. 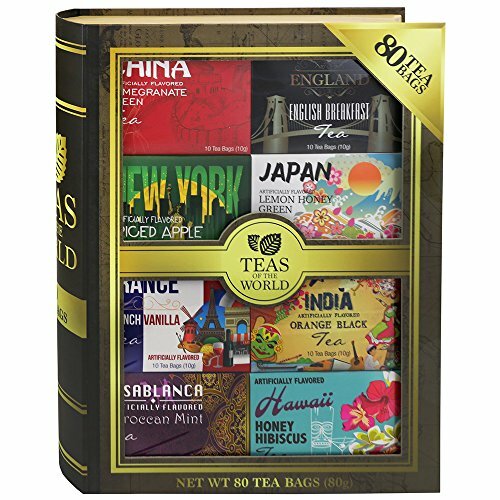 FOR THE TEA LOVERS - Arrives with an assortment of 8 unique blends, with a total of 80 individual packets. Makes a perfect gift for the tea lovers in your life! HOWEVER YOU WANT IT - The perfect cup of tea every time. Simply chose your favorite flavor and steep away! EXPAND YOUR PALETTE - Taste the difference between a fruity Lemon Honey and a classic English Breakfast. If you have any questions about this product by Modern Gourmet Foods, contact us by completing and submitting the form below. If you are looking for a specif part number, please include it with your message.